A recent publication by the East Melbourne Historical Society. A must for every household in East Melbourne. Purchase your copy for $15 by contacting the East Melbourne Historical Society or by enquiring at the Library. A PDF version can also be downloaded from http://emhs.org.au/catalogue/embk0071. What's in a Name? : The Lanes of East MelbourneEast Melbourne’s lanes are an integral part of its historic character. Their bluestone cobbles lead us back to the nineteenth century in a way smoothly tarmacked roads cannot. The lanes were never part of Robert Hoddle’s original plan for East Melbourne. This, like that of the city, was a grid of rectangular blocks each divided into twenty quarter acre allotments. It was only when the allotments were sold, subdivided and developed that the lanes came into being according to the requirements of individual owners. As a consequence no lane is the same: some run the whole length of their block; others are short culdesacs; some have side branches; others narrow down to pedestrian width only. Some lanes have taken on a life of their own providing a street frontage for modern units hidden behind old houses; yet other lanes hold gallantly to the past sheltering old dunnies and reminders of the night-man. Over the last thirty years many of the lanes have been given names: some because of the need to provide a street address for new buildings; others at the request of local residents; but generally as an aid to emergency services in locating a destination. The names are suggested by the Land and Survey Department of the City of Melbourne, and after consultation with immediate neighbours, and, more recently, the East Melbourne Historical Society, are then sent to Council for ratification. The team responsible for naming the lanes, on their own admission, are not historians and often the names chosen have been a random selection from the Rate Books, often simply the name of a person who has lived near a particular lane for a long time; or the name of a house which borders a lane. It is now the purpose of this little book to tell in more detail of the people and places that have given their names to our lanes. The stories encapsulate the rich diversity of East Melbourne’s heritage and highlight the abundance of history around us still awaiting discovery. 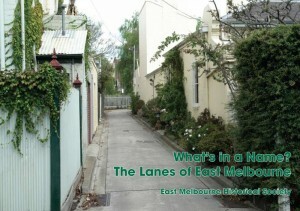 A new publication by the East Melbourne Historical Society. A must for every household in East Melbourne. Purchase your copy for $15 by contacting the East Melbourne Historical Society or by enquiring at the Library.